Ohhh internet friends I am beyond excited to be sharing this new recipe for Chai Roasted Forelle Pears with you all! I got these pears from my dear friends at Melissa's Produce. Melissa's is a produce company is based in California who sends fresh organic fruits and vegetables right to your doorstep. I know it sounds like a total fantasy, but I assure you it's real! You simply pick out whatever fruits and vegetables you like from their seasonable stock and ta-da! Just like magic perfect produce arrives to your house in about 2 days. You don't even have to leave your house!!! Did I mention the taste of the produce is flipping fantabulous? I seriously don't think I've ever had fruit this good. One of my favorite fruits from this package were the Forelle Pears. 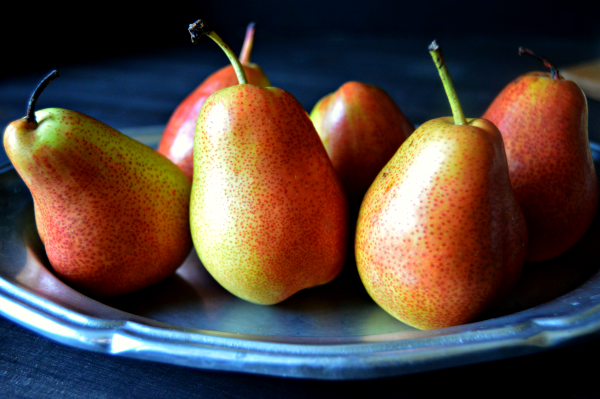 These dainty little things were bursting with a sweetness I've never tasted from other pears. I really wanted to create a recipe that could fully capture the wow factor of this incredible fruit without overpowering it's natural flavors. I thought of several different spices and methods before settling on roasting them in a chai, but once I did everything else fell together seamlessly. The delicacy and romanticism of this dish makes it a wonderful treat to share with your special someone this Valentine's Day. The added bonus is that this recipe can be made without any processed sugar, so you can stay on track with your New Year's resolution even on the sweetest holiday of them all! 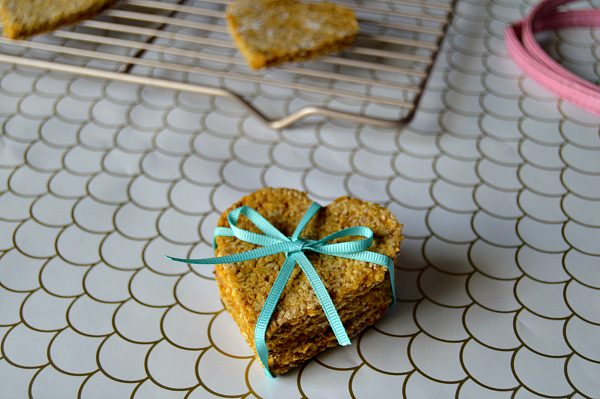 But I promise that you won't feel left out of the dessert/chocolate circle with these. In fact, I can bet these pears will leaving you starry eyed and begging for more! Just don't forget to save a pear or two for your very special someone. 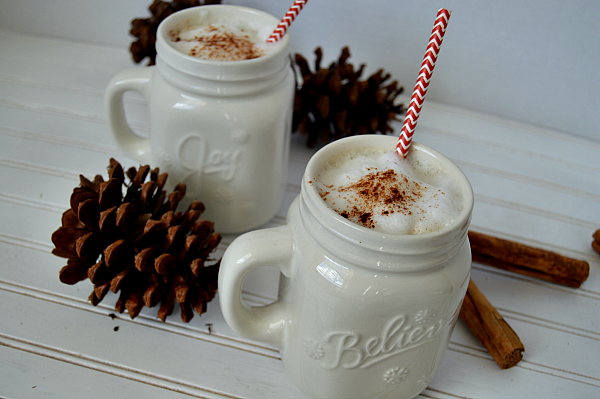 * This is an alternative version of the Chai Concentrate recipe from my Chai Tea Latte. This particular version is sugar-free. This method yields more chai concentrate than you will need, but you can use the remaining concentrate to make my Chocolate Chai Cookies or Chai Tea Latte. Sugar-Free Chai Concentrate: 2 1/2 cups water, 3 bags of strong chai tea, 1/2 tsp vanilla extract, 3 tbsp agave. Bring water to a boil in a small sauce pan then add tea bags. Allow water to continue to boil for 5 minutes. Remove pan from heat and scoop out the tea bags. Whisk in vanilla and agave. **This method will result in more Chai Spice than you need for this particular recipe, but you can use this spice to make my Chocolate Chai Cookies or to just top off your morning bowl of oatmeal. 2. 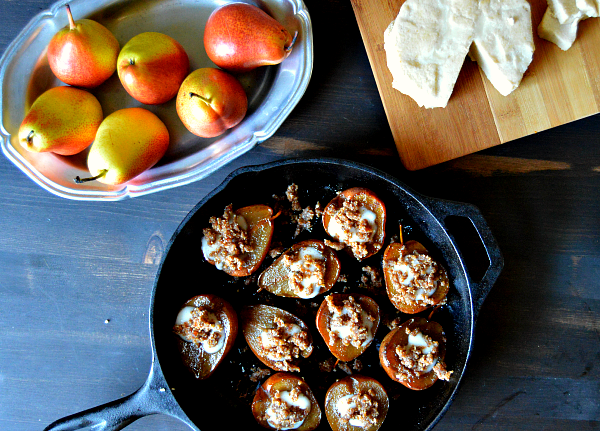 Lay pears sliced side facing up in a cast iron skillet. Gently rub lemon juice over the face of each pear and ab a little bit of Earth Balance onto it. Then pour 1/3 cup of chai concentrate into the bottom of the skillet. 3. Bake pears for 30 minutes. After flip pears over so that the cut side of the pear faces downward. 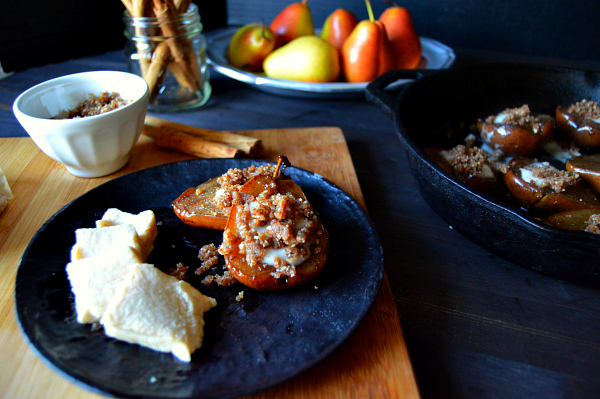 Pour the last 1/3 of the chai concentrate over the pears and into the skillet. Bake for an additional 15 minutes or until a knife can very easily cut the thickest part of the pear. 4. 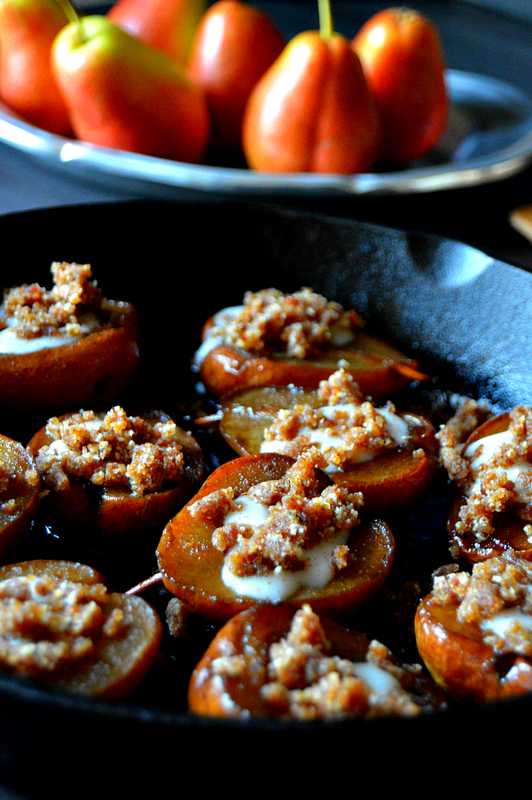 While the pears are baking, begin making your nut streusel topping. In a food processor pulse dates, pecans, almond, walnuts, vanilla extract and chai spice until it has the consistency of streusel. 5. Remove pears from the oven and allow them to cool for 10-15 minutes. 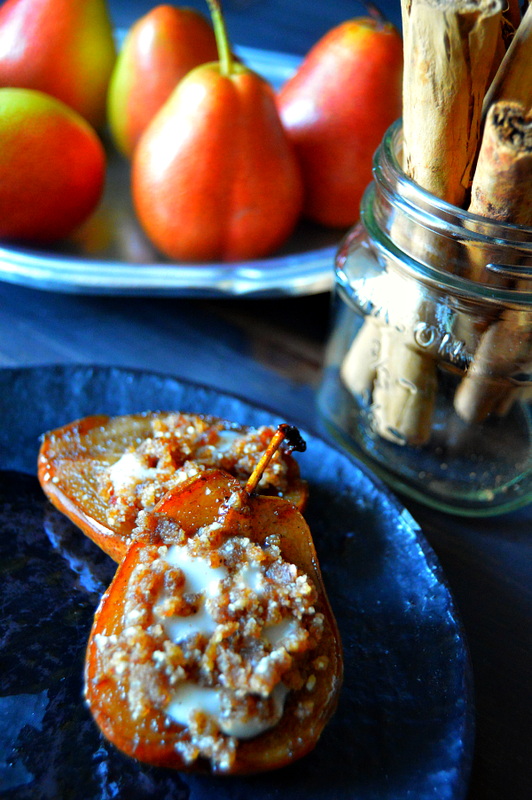 After pears are cool enough to handle fill each with coconut yogurt and top with nut streusel. Serve slightly warm or cool with additional berries, agave or substitute the coconut yogurt for coconut ice cream if your feeling extra daring.